(Phys.org) —An exploding star observed in 1604 by the German astronomer Johannes Kepler held a greater fraction of heavy elements than the sun, according to an analysis of X-ray observations from the Japan-led Suzaku satellite. The findings will help astronomers better understand the diversity of type Ia supernovae, an important class of stellar explosion used in probing the distant universe. "The composition of the star, its environment, and the mechanism of the explosion may vary considerably among type Ia supernovae," said Sangwook Park, an assistant professor of physics at the University of Texas at Arlington. "By better understanding them, we can fine-tune our knowledge of the universe beyond our galaxy and improve cosmological models that depend on those measurements." The best way to explore the star's makeup is to perform a kind of post-mortem examination on the shell of hot, rapidly expanding gas produced by the explosion. By identifying specific chemical signatures in the supernova remnant, astronomers can obtain a clearer picture of the composition of the star before it blew up. "Kepler's supernova is one of the most recent type Ia explosions known in our galaxy, so it represents an essential link to improving our knowledge of these events," said Carles Badenes, an assistant professor of physics and astronomy at the University of Pittsburgh. Using the Suzaku satellite's X-ray Imaging Spectrometer (XIS), the astronomers observed the remnant of Kepler's supernova in 2009 and 2011. With a total effective XIS exposure of more than two weeks, the X-ray spectrum reveals several faint emission features from highly ionized chromium, manganese and nickel in addition to a bright emission line from iron. The detection of all four elements was crucial for understanding the original star. "Suzaku's XIS instrument is uniquely suited to this type of study thanks to its excellent energy resolution, high sensitivity and low background noise," said team member Koji Mori, an associate professor of applied physics at the University of Miyazaki, Japan. Cosmologists regard type Ia supernovae as "standard candles" because they release similar amounts of energy. By comparing this standard to the observed peak brightness of a type Ia supernova, astronomers can pin down its distance. Their similarity stems from the fact that the exploding star is always a compact stellar remnant known as a white dwarf. Although a white dwarf star is perfectly stable on its own, pair it with another white dwarf or a normal star and the situation eventually may turn volatile. The normal star may transfer gas onto the white dwarf, where it gradually accumulates. Or the orbits of binary white dwarfs may shrink until the two objects merge. Either way, once a white dwarf begins tipping the scales at around 1.4 times the sun's mass, a supernova soon follows. Somewhere within the white dwarf, carbon nuclei begin merging together, forming heavier elements and releasing a vast amount of energy. This wave of nuclear fusion rapidly propagates throughout the star, ultimately shattering it in a brilliant explosion that can be detected billions of light-years away. Astronomers can track some details of the white dwarf's composition by determining the abundance of certain trace elements, such as manganese, that formed during the explosion. Specifically, the ratio of manganese to chromium produced by the explosion turns out to be sensitive to the presence of a neutron-rich version of neon, called neon-22. Establishing the star's neon-22 content gives scientists a guide to the abundance of all other elements heavier than helium, which astronomers call "metals." The findings provide strong evidence that the original white dwarf possessed roughly three times the amount of metals found in the sun. Progressive stellar generations seed interstellar gas with increasing proportions of metals. The remnant, which lies about 23,000 light-years away toward the constellation Ophiuchus, lies much closer to our galaxy's crowded central region than the sun does. There, star formation was probably more rapid and efficient. As a result, the star that blazed forth as Kepler's supernova likely formed out of material that already was enriched with a higher fraction of metals. Park, Badenes, Mori and their colleagues discuss the findings in a paper scheduled for publication in the April 10 issue of the Astrophysical Journal Letters and now available online. While the Suzaku results do not directly address which type of binary system triggered the supernova, they indicate that the white dwarf was probably no more than a billion years old when it exploded, or less than a quarter of the sun's current age. "Theories indicate that the star's age and metal content affect the peak luminosity of type Ia supernovae," Park explained. "Younger stars likely produce brighter explosions than older ones, which is why understanding the spread of ages among type Ia supernovae is so important." In 2011, astrophysicists from the United States and Australia won the Nobel Prize in physics for the discovery that the expansion of the universe is picking up speed, a conclusion based on measurements of type Ia supernovae. An enigmatic force called dark energy appears to be responsible for this acceleration, and understanding its nature is now a top science goal. Recent findings by the European Space Agency's Planck satellite reveal that dark energy makes up 68 percent of the universe. I've pointed out these absurdities in the past repeatedly, only to be mocked by the forum mafia. I did the math too before even reading your post, so the radius is allegedly increasing by 0.1C, and the uncertainty in their distance to this "standard candle" is nearly 100%. This is a perfect example of how big a joke cosmology really is. @ebo - first, as Lurker pointed out, the diameter expands twice as fast as the matter moves. This reduces the speed by a factor of two. Second, the whole image is 12 arc-minutes across, not just the remnant, which is 3.5 time smaller. And third, the 80-light-year image size is only at the maximum 23,000 light-year distance. So the matter is expanding at ~0.015c to 0.03c, which is still fast but only requires ~1/100 the kinetic energy required for 0.2c. @lurker - you only caught the first factor-of-two error. Also if you thought for a bit you'd realize that type 1A supernovae are only used as standard candles when we can measure the light of the explosion with modern instruments (both the intensity and the decay curve). 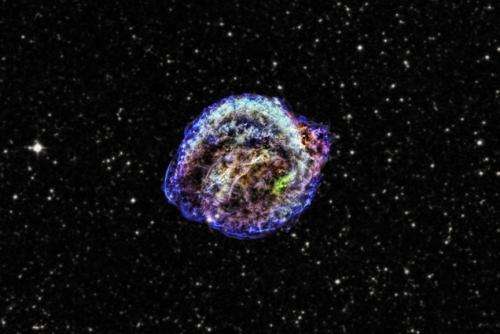 A supernova whose explosion was observed over 400 years ago is NOT used as a standard candle. This is a perfect example of why you should stop criticizing things until you give them a LOT more thought.